Use the Site A icon above to go to the Diorama pages or the drop down menus. Recently there has been a been fad in Japan for collectable figures as premiums for various products like candy, coca cola or bottled water. Dinosaurs have been especially popular. Most seem to have been designed through Kaiyodo. There is often a mystery figure included in the set. A good price is between 3 - 8 dollars but rare pieces can be much more expensive. UHA also known as Mikuta or Choc Eggs are the most popular and successful. For information on other series and Kaiyodo models try the Japanese premiums page. Kaiyodo: Dino Tales, Choco Eggs, UHA, Mikakuto There were 5 series, series 1 and 2 came in two different color releases, and several special releases. 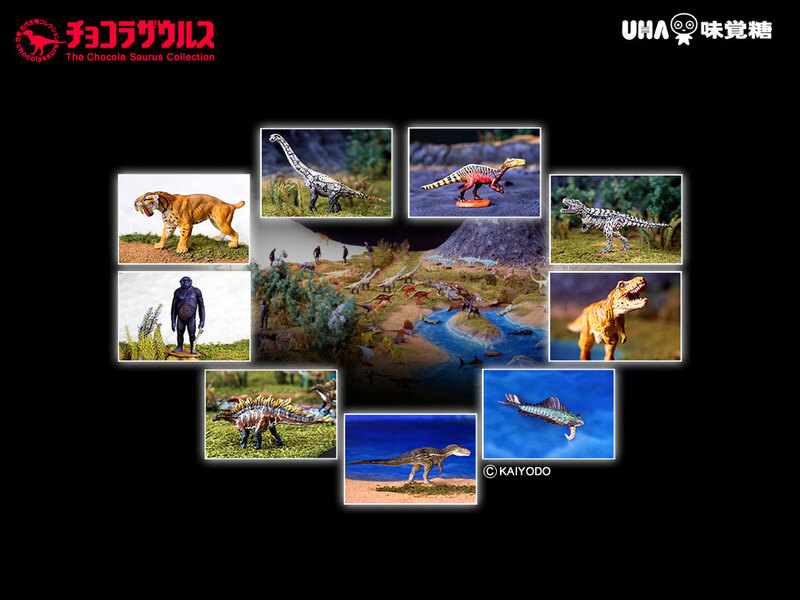 Most of the special releases were repaints only the Siamotryannus, Seismosaurus and Seismosaurus Skeleton being new figures. The UHA was the both the most extensive and interesting of the Japanese premium releases. They have recently become available in a special US language release through Promotopia. All the spellings here were originally taken from the Japanese UHA information sheets that came with the figures. I am correcting the spellings to conform to the English standard but there are still some misspelled names. Series 1 had 24 figures. There were 2 releases they differed in the paint and also in some cases the figure was in few pieces. Series 2 had 24 figures. Series 3 had 24 figures. Some were repainted as special issues. This is series 1 Dinomania from Promotopia. Series 4 has only 14 figures. There were some repaints issued as specials or premiums. There is a change in style with some of the figures having bases that include plants or dead animals. Series 5 has only 10 figures in two different paint schemes. This release is very dinosaur intensive. It seems to be a bottled drink premium where the other series were candy premiums. Series 6 has 12 figures Figures released for a Lemon Drink. Series 7 has 10 figures with 2 differet paint schemes. Click on the Site A icon to the right for Dioramas organized by period or by manufacturer.